ROLLING STONES Exile On Main Street D/LP 1972 UK 1st Press!! 1/1/1/1 MATRIXES!! On offer here is a VERY rare Double LP (especially in this condition!!!!) by The Rolling Stones called "Exile On Main Street" and is an ORIGINAL1972 UK 1st Pressing on the 1st Press Rolling Stones label!!!! THIS DOUBLE LP IS SERIOUSLY RAREAND VIRTUALLY IMPOSSIBLE TO FIND!!!! THIS IS ONE OF THE ROLLING STONES RAREST LPs EVER - AND VIRTUALLY NEVER TURNS UP FOR SALE!!!! JUST TRY AND FIND ANOTHER ONE!!!! IT IS ONE OF THE MOST SOUGHT AFTER LPs ON THE ROLLING STONES LABEL - AND IS INCREDIBLY TOUGH TO LOCATE TODAY!!!! NOT ONLY THAT BUT THIS IS THE 'EARLIEST' 1ST PRESSING EVER MADE - AND COMES WITH ITS ORIGINAL 'PICTURE' CARD INNER SLEEVES, AND1ST PRESS 'BOX SHAPED' COVER!!!! HOWEVER WHAT MAKES THIS DOUBLE LP EVEN RARER STILL IS THAT IT IS A 100% GENIUNE 1972 'EARLIEST' 1ST PRESSING FROM THE VERY 'DAY OF RELEASE' BACK IN 1972 - AND IS 100% COMPLETE WITH ITS ORIGINAL POSTCARDS (USUALLY MISSING!)!!! !AND THIS IS ALMOST IMPOSSIBLE TO FIND ON THIS DOUBLE LP!!!! 100% GENIUNE UK 1ST PRESSINGS ARE SERIOUSLY RARE NOW, ANDAS THIS LP WAS PRESSED THROUGHOUT THE 1970s - IT MAKES IT VITALLY IMPORTANT TOSHOW THAT THIS IS INDEED A 100% GENIUNE UK 1ST PRESSING FROM THE VERY 'DAY OF RELEASE' BACK IN 1972!!!! ALSO 'COVER & RECORD' SWAPPING ARE COMMON ON THIS LP -SO AGAIN IT IS VITALLY IMPORTANT TO SHOW THAT ALLPARTS OF THIS LP ARE ORIGINAL AND CORRECT TO THIS 'EARLIEST' 1ST PRESSING!!!! THIS DOUBLE LP IS 100% ORIGINAL, WAS BOUGHT ON THE 'DAY OF RELEASE',AND HAS ONLY EVER HAD 1 VERY CAREFUL OWNER FROM NEW -AND I WILL NOW EXPLAIN ALL THE 1ST PRESS DETAILS BELOW:- FIRSTLY THIS LP HAS VERY THICK QUALITY VINYL AND MILES THICKER THAN ANY LATER PRESSING!!!! SECONDLY THIS DOUBLE LP HAS NO 'PROMOTONE' REFERENCE ON THE LABELS (LATER ONES DO!)!!!! THIRDLY THE 'PICTURE' INNER SLEEVES ARE ARE MADE WITH THICK QUALITY CARD (LATER PRESSINGS ARE MUCH THINNER!)!!!! AND LASTLY THIS DOUBLE LP HAS THE 'EARLIEST POSSIBLE' STYLE OF 'BOX SHAPED' GATEFOLDCOVER (LATER PRESSINGS HAVEMUCH THINNER COVERS) & AND IS 100% COMPLETE WITH ITS ORIGINAL 'FULL SET' OF POSTCARDS (LATER ONES DONT!)!!!! IT IS ALSO VERY IMPORTANT TO STRESS THAT ALL PARTS OF THIS LP ARE UK 1ST PRESSED!!!! OFTEN ON LATER PRESSINGS EXPORTED GERMAN COVERS OR INNERS WERE USED - BUT THIS LP IS A 100% GENIUNE 'EARLIEST' UK 1ST PRESSING WITH A UK MADE COVER, UK MADE INNERS, UK MADE 'FULL SET' OF POSTCARDS, AND UK 1ST PRESSED SET OF RECORDS!!!! BUT WHAT MAKES THIS DOUBLE LP REALLY SPECIAL - IS THAT IT HAS THE 'EARLIEST POSSIBLE' 1ST PRESS A1/B1/C1/D1 MATRIX ENDINGS!!!! AND IMPORTANTLY BOTH RECORDS WITH THESE MATRIXES ARE BOTH IN ABSOLUTELY STUNNING CONDITION TOO!!!! QUITE LITERALLY ONLY A FEW HUNDRED OF THE 'EARLIEST' 1ST PRESSINGS ONLY - EVER HAD THESE 'EARLIEST' 1ST PRESS MATRIXES - BEFORE THE NUMBERS STARTED TO RISE!!!! BARELY ANY 1ST PRESSINGS OF THIS DOUBLE LP STILL EXIST WITH THE 'EARLIEST' 1ST PRESS A1/B1/C1/D1 MATRIX ENDINGS (ESPECIALLY WITH STUNNING RECORDS LIKE THESE!) - AND MAKE THIS ONE OF THE ALL TIME RAREST ROLLING STONES LPs ANYWHERE IN THE WORLD TODAY!!!! AND ALSO INCLUDED WITH THIS SET (MAKING IT TRULY 100% COMPLETE!) IS THE UK ONLY 'PROMOTIONAL' ADVERTISING 'FLEXIDISC' (SEE PICTURE!) THAT WAS ONLY MADE IN ABSOLUTELY TINY AMOUNTS TO PROMOTE THIS LP PRIOR TO THE RELEASE DATE!!!! NOT ONLY THAT BUT THIS DOUBLE LP IS IN ABSOLUTELY BRILLIANT CONDITION (WITH A STUNNING SET OF RECORDS!) - AND CLEARLY HASNT BEEN PLAYED MUCH AT ALL!!!! JUST TAKE A LOOK AT THE PICTURES!!!! 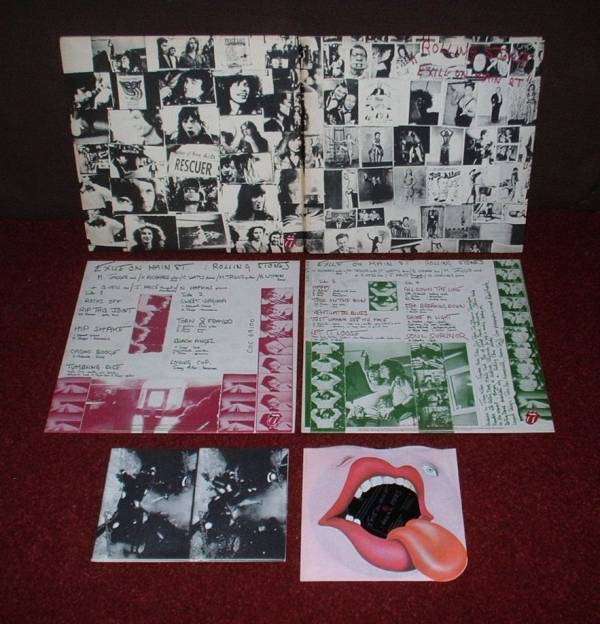 THIS IS THE ORIGINAL 1972UK 'EARLIEST' 1ST PRESSING ON THE 'EARLIEST' 1ST PRESS ROLLING STONES LABELS, 'EARLIEST POSSIBLE' 1ST PRESS A1/B1/C1/D1 MATRIX ENDINGS, 'EARLIEST' 1ST PRESS 'PROMOTIONAL' FLEXI-DISC, 'EARLIEST' 1ST PRESS 'PICTURE' CARD INNER SLEEVES, 'EARLIEST' 1ST PRESS 'BLUE TEXT' PLAIN WHITE INNER 'INNER' SLEEVES, 'EARLIEST' 1ST PRESS 'FULL SET' OF POSTCARDS, AND 'EARLIEST' 1ST PRESS GATEFOLD 'BOX SHAPED' COVER!!!! THISDOUBLE LP IS INCREDIBLY HARD TO FIND IN THIS BRILLIANT CONDITION (ESPECIALLY 100% COMPLETE AND THE 'EARLIEST' 1ST PRESSING EVER MADE!) - SO DONT MISS OUT ON THIS AMAZING OPPORTUNITY!!!! This isthe ORIGINAL Rolling Stones UK 1st pressing from 1972 and is in SUPERB condition!!!! The records are pressed on THICK quality vinyl. The Cat. No is COC 59100 on the ORIGINAL 1st Press Rolling Stones Labels (see picture) and is aStereo 1st pressing!!!! All the tracks are pure quality Rolling Stones at their best!!!! Any fan of The Rolling Stones, or 60s music in general, will want to have this in their collection!!!! The record labels to BOTH records are in SUPERB condition (see pictures) with NO writing,NO wear and only a VERY few light spindle marks!!!! IT IS VERY CLEAR THAT THESE RECORDS HAVENT BEENPLAYED MUCH AT ALL!!!! The vinyl on BOTH records is in absolutely SUPERB condition!!!! Most of these 60s/70s LPs had been to a lot of wild parties and are usually found totally worn out, and almost unplayable. This one is NOT and BOTH records have NO scratches, NO scufflines, only 2 or 3 absolutely ULTRA light hairline traces (only visible under the VERY brightest of lights ONLY! ), and only a VERY few of the lightest paper scuffs only visible under light!!!! ITS AS SIMPLE AS THAT!!!! BOTH RECORDS STILL RETAIN THEIR ORIGINAL 'JUST PRESSED' LOOK AND LOOK SUPERB!!!! It is alsogreat to find that the records play as STUNNINGLY as the visual withNO pops, NO sticking, NO jumps, barely ANY crackle AT ALL, and only some EXTREMELY low level background sound on the run on grooves & gaps - NOT in the music AT ALL!!!! The sound quality is simply SUPERB with NO distortion and NO groovewear either!!!! BOTH records must grade Excellent+ if not better - though I suspect 99% of people would grade this set NM/NM!!!! WHAT AN ABSOLUTELY STUNNING SET OF RECORDS!!!! Believe me this record is NOT overgraded in ANY way!!!! I use STRICT RC grading standards - it is not in my interest not to!!!! Brillant!!!! The ORIGINAL 1st Press 2 'Thicker' card 'Picture' inner sleeves are in absolutely SUPERB condition - with NO splits, NO tears, & NO repairs either!!!! The 1st Press 'Blue Text' plain white inner 'inner' sleeves are both in SUPERB condition!!!! THE ULTRA RARE 'FULL SET' OF POSTCARDS ARE IN ABSOLUTELY SUPERB CONDITION - STILL 100% PERFECTLY ATTACHED TOGETHER, AND CLEARLY HAVENT EVER LEFT THE COVER!!!! The ULTRA RARE 'Earliest' 1st Press'Box Shaped' GatefoldCover is in absolutely BRILLIANT condition - and almost NEVER seen like this now!!!! The cover still retains a SUPERBshape and hasNO sticker tears, NO sticker marks, NO edge wear, barely ANY spinal wear AT ALL (virtually NONE! ), a STUNNING right spine (still PERFECTLY square shaped, and with PERFECT 'side words'), NO splits, only slight corner wear (NOT through the colour! ),NO rubbing, NO ringwear, barely ANY creases AT ALL (cover retains a SUPERB shape! ), NO grubbyness, barely ANY yellowing, NO rips, NO tears, NO annotations, and NO writing!!!! The opening edges are beautifully straight with barely ANY feathering AT ALL!!!! Even the inside of the coveris in SUPERB condition with NO grubbyness, NO rubbing, NO ringwear, barely ANY yellowing AT ALL, and NO writing!!!! The cover must grade Very Good++++ if not better!!!! BRILLIANT COVER!!!! THIS DOUBLE LP IS SERIOUSLY RARE AND VIRTUALLY IMPOSSIBLE TO FIND LIKE THIS (ESPECIALLY AS THE 'EARLIEST POSSIBLE' 1ST PRESSING EVER MADE WITH A1/B1/C1/D1 MATRIX ENDINGS & 100% COMPLETE WITH 'PROMOTIONAL' FLEXI-DISC!) - SO DONT MISS OUT ON THIS INCREDIBLE OPPORTUNITY!!!! HAVE A LOOK AT MY PICTURES - I DO MY BEST TO SHOW THE RECORD FROM ALL ANGLES AND MAKE THE PICTURES AS CLEAR AS POSSIBLE - THERE IS NOTHING TO HIDE!!!! It really is a GREAT looking LP and it is truly rare to find any copies of this MEGA RARE LP!!!! THIS WILL BE YOUR ONLY CHANCE TO BUY AN ORIGINAL 1972 UK 'EARLIEST' 1ST PRESSING OF "EXILE ON MAIN STREET" BY THE ROLLING STONES, IN SUPERB CONDITION!!!! Dontforgetto take a look at allmy other items including many other TOP LPs and contact me with any queries you may have. Postal discounts for multiple buys are always available - and I guarantee to ALWAYS undercharge on postage! Paypal, Bank Transfers, Cheques, International Money Orders, and Postal Orders accepted. Thanks for looking! Cheers!!!! !